Today I went to Her Majesty’s Prison Verne. And not before time, you might say. A reader suggested a week ago that my best plan to watch the racing was to get an ice cream from that Weymouth institution Rossi’s and claim a viewpoint right outside the gates of HMP Verne on Portland. I made the expedition today on my bike, and I learned a number of interesting things from this. First of all, the ice cream is long gone before you get there, both atmospherically and literally. Secondly, the viewpoints are excellent, as shown above, but a little too distant across the various courses to be that helpful. And also (mmmm, how to put this?) Portland is an acquired taste. Not mine. More helpfully, I hope, I did discover that there are some very good spots from which to watch the Portland Harbour race courses, so long as you bring binoculars with you. You can see the list of when various fleets racing in this area here. 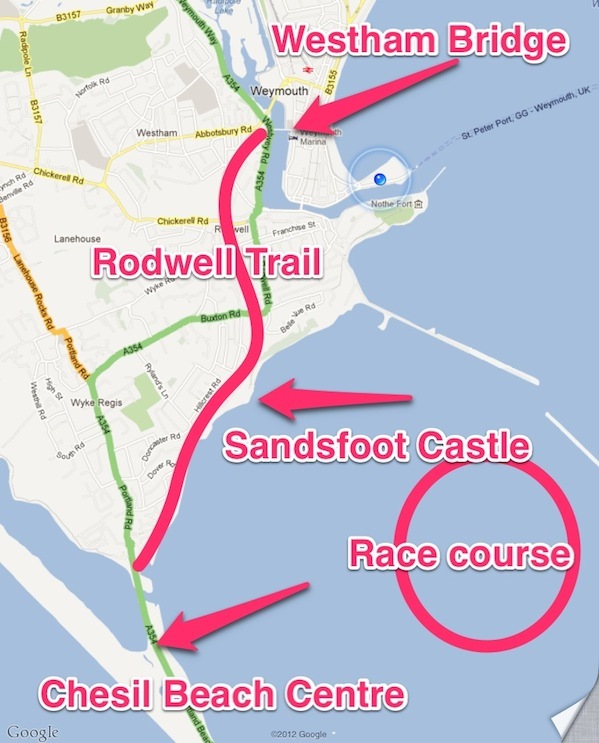 There is a tarmac path called the Rodwell Trail that runs all the way from Weymouth to the start of Chesil beach. It traces the route of and old, disused railway line that has been recreated as a pedestrian and bike path. It runs from Westham Bridge near the town centre and I’ve marked it on the map at the foot of this story. 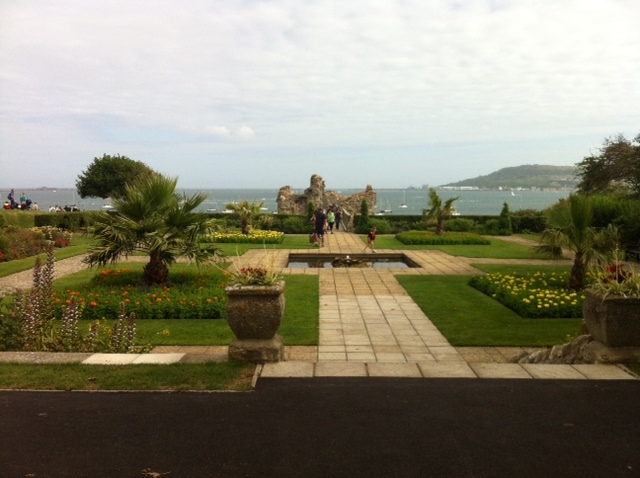 You can take this and walk or cycle out to the park at Sandsfoot Castle, pictured below. Quite a lot of people had done this and brought picnic chairs. 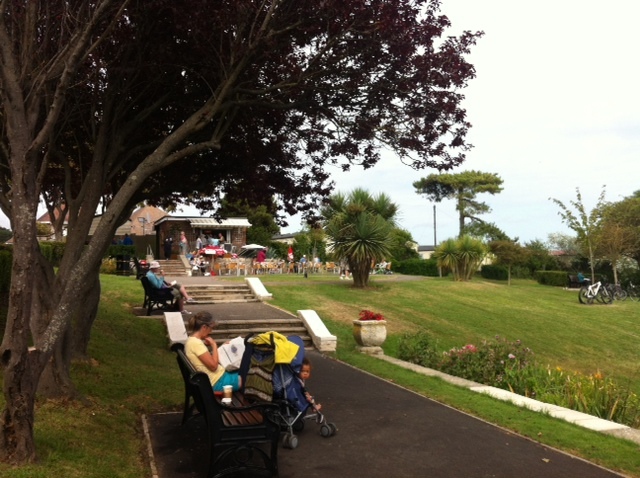 There’s a lovely park here and a kiosk cafe, with good views over Portland Harbour. Really seaside holiday stuff. Further along there are a few benches, also with good views. And right at the end of the path at the start of Chesil Beach, also with good views over the road, is the brand new Chesil Beach Visitor Centre. 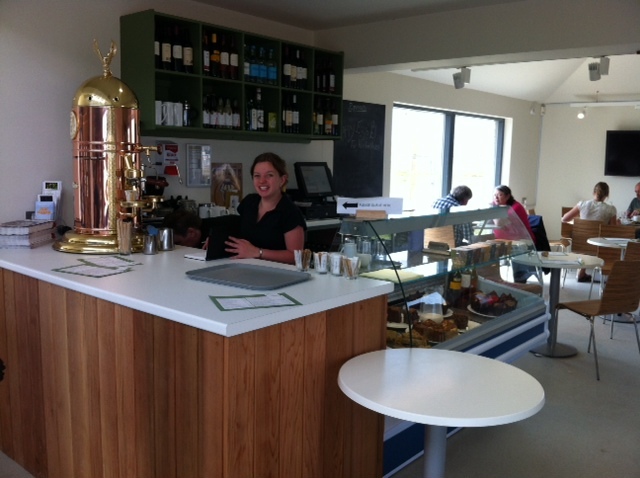 It opened only three weeks ago and it has a really good cafe overlooking the lagoon that specialises in fishy things. It’s open 1000-1600 and 1800-2000 serving snacks and meals such as crab fritters, bouillabaisse, mackerel, etc – reasonable prices, too. Think you’re going to find me back there soon. I watched today’s Laser and women’s Laser Radial races from near the centre with binoculars, while following the Finn drama on my phone streaming the BBC video player on 3G. It was perfect. What an exceedingly pleasant way to pass the afternoon, or a very constructive day’s work if you prefer. What else can I tell you? Weymouth Olympic organisers have really gone to town to provide for cycling, with lots of big, secure bike parks. There’s an enormous one at Westham Bridge, which is right by the Swannery main transport hub. Again, I’ve marked this on the map. I brought my bike down by train today. The bike racks were empty; there are 2-3 spaces per 3 carriages on SW Trains. Bike transport is free. One final note before this weekend: after Ben Ainslie’s nailbiter today against his big rival Jonas Hogh-Christensen, the Finn final will come down to the medal race on Sunday. Do get here early to claim your spot in case (as today), the traffic is slow-going for the last mile.